What do you get the photographer who seems to have everything? Here are 10 suggestions of accessories every photographer oughta own. You should be able to find a gift for every budget, as these suggestions range from $10 to $400ish. If you are thinking of buying a DSLR camera, consider my recommendations for the Nikon photographer or Canon photographer. I have kit selections for the beginner, enthusiast, or pro. Give the perfect gift to the photographer in your life. 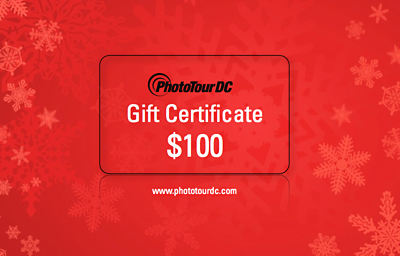 Purchase PhotoTour DC gift certificates in $25 increments, good toward any PhotoTour DC excursion or private coaching.